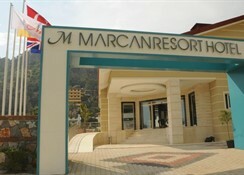 The 4-star Marcan Resort Hotel has everything that guests could ever want for a laid-back getaway. 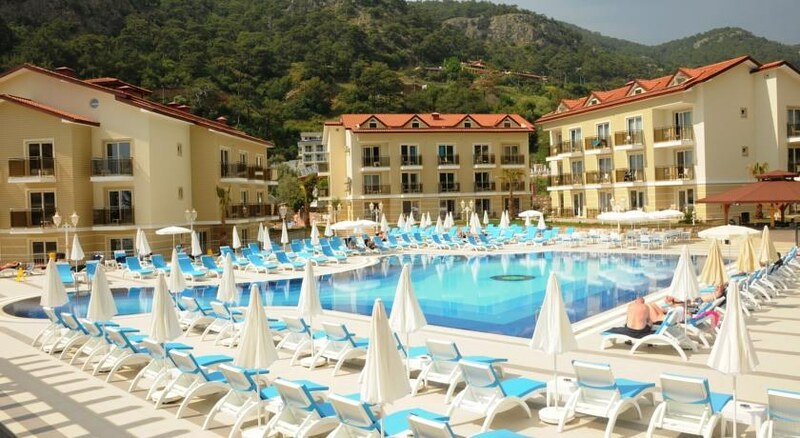 The peaceful location of Olu Deniz ensures that guests can relax and unwind although it comfortably caters to couples and families alike. The large outdoor pool with mini pool and slide is ideal for the kids and there is always plenty of entertainment on offer. 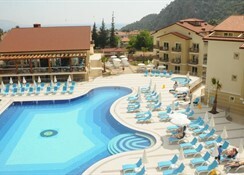 The hotel has a fitness centre and spa while the accommodation is luxurious and relaxing. The beach is just a short walk away while the Marcan Resort Hotel offers simple access to castles, beaches and Water Parks, helping to create the ideal holiday for all. Guests can explore this wonderful location with ease or they can simply choose to enjoy the amazing surroundings. Beach lovers will enjoy the beautiful beach that is just 500m away giving them the chance to embrace the glorious Turkish coastline. In the area, there are shops, restaurants and bars that are just a casual stroll away and for those who like to head out for the day, there are water parks and historical sites that offer a great way to spend a few hours. 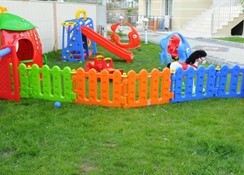 Dalaman Airport is 70km away from the complex. All 121 rooms are lavishly styled with modern colours and space delivering guests with a touch of luxury and comfort. There are standard rooms to choose from and family rooms, ensuring that there is accommodation suitable for couples and families. All rooms come with a private bathroom, satellite TV, telephone, minibar, air conditioning, WiFi and a balcony offering views over the pool or surrounding area. For guests who enjoy a great dining experience, the buffet-style restaurant with its lively atmosphere is sure to tick every box. There is a great selection of dishes for breakfast and lunch while Turkish and international cuisine is also available during dinner. 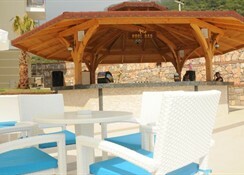 Guests can choose to dine indoors or outdoors while the bar serves a great selection of drinks throughout the day. Restaurants and bars outside of the complex provide additional dining options for those who like to mix things up. Guests both young and old will love the large outdoor pool with two water slides while the children’s pool, daily activities and playground give the little ones plenty to keep them busy. 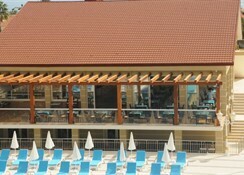 For those who like to keep active, gymnastics, aerobics and animation shows take place around the pool while the fitness centre is the place where all can grab a workout before trying out the Turkish Bath. 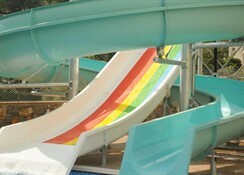 There are water sports on the beach and an aqua park located nearby. The food is very poor, which is a shame because it is a brilliant hotel .